I baked this cake back when the days were still long and we could lay in bed in the temporary cool of night sure that once morning broke, the heat would once again settle in and wrap itself around us like an uxorious husband. These were not ideal baking days, but like so many of you, I did it anyway. My ideas, it seems, don’t read the weather report. This cake was meant to be a hostess gift for my boyfriend’s family, whom I was to meet for the first time during a weekend away at their vacation home. I was nervous, naturally, but there are few things better than cake to take one’s mind off things. The baking, oppressive heat and all, actually proved to be the smoothest part of the whole process. "Just bring a bottle of booze," my boyfriend suggested when I ran my 37th cake idea past him. "Or we can get something from the bakery…" "No," I said, flatly refusing his patient attempts to ease my anxiety. I wanted to bake a cake. I was going to bake a cake. And it would be good. So I kept thinking. It was the lush season. Cartons of the jewel-like berries so plump they could burst abounded in teetering piles in just about every store display. Even the corner street vendor (with his perpetually soggy cigarette) boasted an impressive array of blackberries, blueberries, and strawberries so fragrant they easily overpowered the foulest of Midtown-in-August scents. Oh and the peaches! Intoxicatingly perfumed and inappropriately voluptuous, they stuck out imprudently among the produce like sluts at Sunday Mass. The displays were irresistible. I went out for stamps one day and gave in, returning to the cool hum of my office carrying flimsy plastic bags filled with summer fruit. I toyed with one idea after another, occasionally testing them out on my coworkers and family. An almond peach upside-down cake caught the fancy of my officemates who dawdled around it, serving themselves one thin slice after another while cracking the usual jokes about it being healthy “since it contained fruit.” “Those are barely peaches,” I said, pointing to the fruit nestled into the crackling crust of dark brown sugar. I’d macerated them in rum and baked them to a custard-like tenderness that surely retained few of their original health benefits. The next day, when the work cafeteria dessert table featured Oprah’s best friend Gayle’s recipe for polenta peach upside-down cake (these sorts of things happen when you work in magazines), my coworkers came back upstairs looking for leftovers. “It’s terrible,” they said of Gayle’s cake. “Dry. Crumbly. I bet even Oprah would like yours better.” That seemed to seal it. A conjectured blessing from Oprah was certainly a good thing. “I think its too sweet,” boyfriend suggested tentatively. The air flew out and the anxiety once again swelled. I would need a new plan. My head buzzed as he offered a list of his family’s likes and dislikes: “Something moist and spongy. Maybe a layer cake with a filling inside. Creamy or custardy. They like berries. Not too sweet. No chocolate. Frosting is good, but not too sweet.” I also needed something that would keep well in the car drive from New York to Pennsylvania and taste just as good (if not better) the next evening when it would actually be consumed. Somehow, the idea was born. I started with an almond sponge cake, moist with a hint of lemon and a generous sprinkling of fresh blueberries baked throughout. The frosting would be lemon cream cheese, which was easy and stiff without cloying. And the filling would be lemon curd. Fresh of course, and just tart enough to cut the sweetness of the cake and frosting. I would prepare the cakes and fill them but leave the frosting in a separate container to finish the next day. Whole fresh blueberries would top the cake. I finished the cake in his family’s kitchen, swirling the creamy white frosting while my boyfriend and his 13-year-old cousin studded the top with berries and she asked me about my piercings and the Jonas Brothers and the other things teenage girls like to ask their older cousin’s 25-year-old magazine editor girlfriends. It was cooler in the mountains. There were crickets and singing birds and, if you paused for a second, you could actually hear the wind rustle through the leaves. And as I smoothed out the spoonfuls of creamy sweetness I felt completely and perfectly calm. 2. In a medium bowl, mix together the flour, baking powder, and salt. 3.In a separate bowl, toss together 2.5 cups of fresh blueberries with a few tablespoons of the flour mixture. Tossing the berries with flour is an important step that will keep the berries aloft in the cake instead of letting them all sink to the bottom. Set both of these aside. 4. In the bowl of your electric mixer, add the almond paste, broken up or grated into little bits. Add the sugar and mix with the paddle attachment for two minutes..
Add the softened butter to the almond paste and sugar and cream until light and fluffy. 5. Slowly add the eggs, one at a time, allowing each one to beat and incorporate. Add the extracts and lemon zest. 6. One half cup at a time, add the flour until it is all incorparated. Be careful not to overmix. 7. Remove the base from the mixer and use a spatula to gently fold in the floured blueberries. Place 1 cake layer on a platter. Tuck pieces of parchment or wax paper under the sides to keep the frosting from dirtying the serving dish. Spread 3/4 cup of the fresh lemon curd (recipe below) in the center of the cake, staying away from the edges. The cake can be made up to one day ahead. To keep in the fridge, top with either a cake dome or tent foil over the cake to keep from touching the frosting. Remove from the fridge about 30-45 minutes before serving to allow for the best flavor. 1. In a medium saucepan, whisk together the lemon juice and zest, sugar, and eggs. 2. Place over medium-low heat and stir in the butter, whisking continuously. The curd will start to thicken in about five to six minutes. 3. Remove from heat once its thick enough to coat the back of a wooden spoon and the bubbles start to just break the surface. Pour into a nonreactive bowl (glass works) and press plastic wrap onto its surface to prevent a skin from forming. Chill for at least one hour, preferably four. This will keep in the fridge in an air-tight container for one week. 1. Add the softened cream cheese and butter into the bowl of an electric mixer and beat until very light and fluffy. 2. Gradually add the confectioner's sugar, 1 cup at a time until fully incorporated and thick. You may only need about four cups but use as much as you'd like. 3. Mix in the lemon zest and the extracts. 4. Cover with plastic wrap and refrigerate until firm or up to three days. Summer might be technically over- but it is still very much summertime in New Orleans- we don't get cool weather until mid-November so I can definitely sneak another Summer dessert in! Thanks for the delicious idea! This looks (and sounds!) delicious! Love the story too!! Your cake sounds divine and looks pretty! I wish I could have gotten a peak at what the inside looked like! Hope your visit with the parents went well after all the stress of deciding what cake to make! Brilliant imagery Alejandra. Just, absolutely brilliant writing. Ingrid: I actually do have an inside shot of the cake but it's not as well lit. I might post a bit later though. Ryan: thanks so much...that actually means something coming from a talent like you. Dana & Emily: I envy you the extra bits of summer! I SO cannot wait to make this! What a great flavor combo for a cake! It sounds so tasty! I *just* made cupcakes a few nights ago with lemon cream cheese frosting! The cakes were OK; the frosting, fantastic. Fun site, BTW. I love your header image! 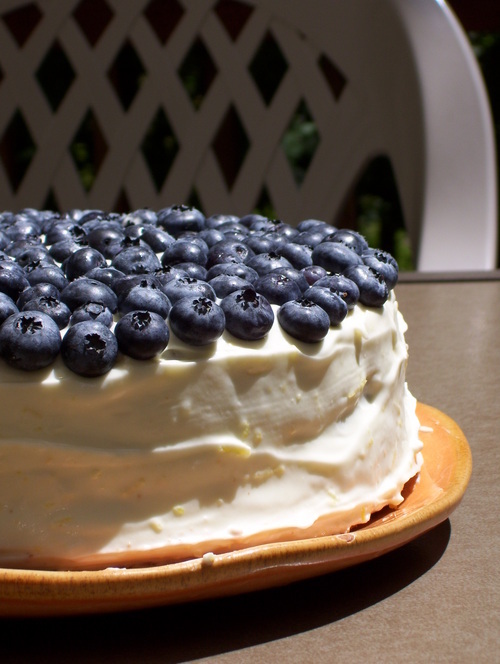 That is a very beautiful cake, especially with all those blueberries Great end to summer (at least here). I would just like to say that I love your recipes and I find myself inspired by the way you write about food. I too love cooking and writing, and haven't been able to combine my passions like you have. I too had a culinary epiphany, I went in to my college to register for the next semester and ... didn't. I called a bunch of culinary schools the next day. Now I'm due to start classes on Oct. 25, and I couldn't be more excited. I just stopped to say that you've inspired me and reassured me that my epiphany and quick choice were the right ones. Hey cake looks amazing, amazing enough that im goin to bake it tomorrow. Thanks for all the great recipes and brilliant writing, your blog is a favourite of mine. Oh I bet they loved it! That is an inspirational cake...yum! Love the collection of fruit cakes you have here. Fruit in baking is a passion with me!